This cut is about right. Historically, Chemero notes, psychology has been done either by (European) structuralists (like Wundt and Titchener) or by (American) functionalists (like William James). Functionalists insist that mental acts must be understood in context; you cannot decompose mental acts the way structuralists want because there are no abstract, task-independent components from which to build a mental act in the first place. One doesn't merely 'see a visual stimulus'; one 'sees an object in order to grasp it' or 'sees an object in order to throw it'. The process of 'seeing' is different each time, and it's just unfortunate we use the same word (instead of, for instance, the full phrases). Besides James, John Dewey's 'The Reflex Arc Concept in Psychology' (Dewey, 1896) is the best known exposition of this American brand of psychology. 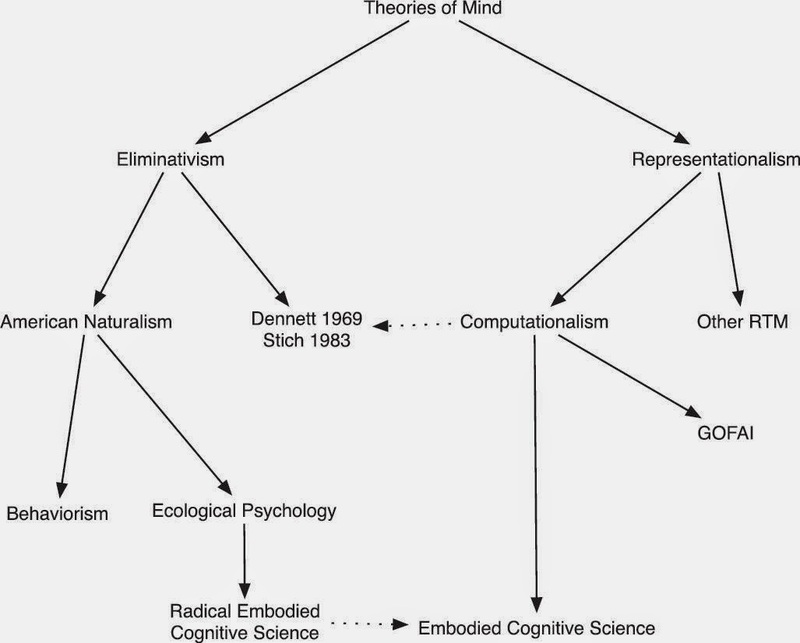 Representational theories of mind therefore descend from the structuralist school. These theories have proliferated over the years, but are mostly (broadly speaking) computational - cognition is some form of rule based manipulation of some form of symbol. The key point is that organisms represent the world and act via those representations. There remains a problem, however; embodied cognition as currently practiced is still a representational theory of mind, specifically a computational theory. Embodied cognition attempts to 'offload' some of the cognitive work onto parts of the body and the environment, but still considers that work to be computational and the non-brain parts of the system to be representations. Chemero considers this to be a problem (and frankly, so do I). Specifically, he's identified the fact that this flavour of embodied cognition is trying to combine two incommensurable approaches to the mind and cognition by simply sexing up representations to be action-oriented by design rather than action-neutral controllers of action systems. This is Andy Clark's approach, for instance. Those tools are going to be dynamical systems. Chemero points out an initial concern, that dynamics is actually neutral with respect to representations (this is why many researchers are still able to talk representationally, even while trying to be embodied or more ecological). This of course cuts both ways and Chemero can rely on dynamics for his anti-representational accounts as much as Clark (or Barselou, 2008) can for their representational one. The next chapters will defend this interpretation of dynamical systems. A second concern about using dynamical systems is that many people feel it can't account for 'real cognition'. Even Andy Clark thinks dynamics tops out eventually, and while it will get us a long way, there will still be 'representation-hungry' problems such as 'thinking about things in the absence of that thing' that will require mediation by representation. As a brief counter-example, Chemero reviews the results of a paper (Van Rooij, Bongers & Haselager, 2002) that uses a simple dynamical systems model to predict behaviour in a task where participants had to imagine using a rod to reach for a target. The data supported the (qualitative) predictions of the model, suggesting that such models can handle this type of 'representation-hungry' problem. Chemero will use this line of attack (tackling 'representationally hungry tasks' with dynamical systems) again later. Chemero is hitching a ride with Heft (2001) at this point. Heft established that Gibson had a respectable intellectual pedigree to James via Holt and thus ecological psychology wasn't just arriving fully formed out of left field. Chemero is proposing that RECS is the next step in this academic family tree; this seems fair to me, and a point worth repeating; I appreciated Heft's analysis and I think it helps ground ecological psychology as continuous with some respectable themes in psychology. As much as I respect Turvey and what he's done for the field, his writing is filled with esoteric ideas and terms and I know a lot of people who simply rule ecological psychology out based on how 'out there' the whole thing sounds. Turvey does this for a reason: he's being disciplined and technically precise, and it's good to have this rigour, but it's had consequences for how people see the idea of direct perception. The family tree approach is actually a nice contribution all by itself. It exposes a serious contradiction in one of the main branches of embodied cognitive science, and it would be interesting to see if anyone comes up with a meaningful defence. My hunch is that they will simply continue to run bad studies. It is a fact, though, that the term 'embodied cognition' has been checked out of the library by numerous camps, and this has just lead to Hegelian arguments among proponents that achieve exactly nothing. This analysis clarified a few things for me in a nice straight-forward manner. Chemero also believes that RECS can be a successful theory of extended cognition. Adams & Aizawa's coupling-constitution fallacy doesn't apply, he claims, because he isn't trying to couple anything to anything else. Chemero suggests that Andy Clark, etc, leave themselves open to the CC critique because they are still representationalists. When you have an environment and a representation of an environment, 'coupling' is still a sensible way to talk about how these separable element are related. But if you instead have a non-linearly coupled animal-environment dynamical system, the elements are not separable; the system is non-decomposable into parts, and thus there can only be constitution. Unsurprisingly, Ken doesn't really buy this decomposability idea; he and Adams also think you can have an extended cognitive system composed of cognitive and non-cognitive processes, but that doesn't make the non-cognitive processes cognitive. Andy Clark tries to bypass this problem by accepting that only certain types of couplings will work. Other authors (including a paper I just finished blind reviewing) go further, and claim that genuine systems (where the behaviour in question simply cannot occur without both internal and external resources acting as an irreducible complex system) avoids the CC fallacy. Chemero is in this latter camp; I am, frankly, entirely sympathetic and I think this is a legitimate answer to the fallacy problem; it takes a step back and reconsiders what a cognitive act actually looks like, and comes to the conclusion that it spans animal and environment. This, I think, is the right path. That said, it is complicated, and it's not quite solved by Chemero's appeal to non-decomposability. For instance: Chemero is still open to the CC critique because even though a given dynamical system might be non-decomposable into parts while functioning, the system does need to be disassembled and reassembled over time; I'll need my hand for something else later, for instance. This process of 'soft' assembly and reassembly entails coupling, uncoupling and recoupling of the components of dynamical systems that will include animal and environment elements. Adams & Aizawa can then simply point out that some of these components are non-cognitive (because they don't meet their 'mark of the cognitive' criteria). I think this type of objection is beatable, but it's going to require more care than Chemero gives it here. The missing piece is, I think, the notion of the task-specific device (Bingham, 1988) which I intend to blog about in some detail when I get some time. So Chapter 2 ends with RECS identified and placed firmly in historical context. The next two chapter defend the radical part of the story (anti-representationalism) by first laying out what a representation is, and then proposing a way to avoid them being inevitable.